This is a sponsored conversation written by me on behalf of Knorr®. The opinions and text are all mine. Does the craziness of the holiday season interfere with your routines? I'm not the most organized person to begin with, so adding shopping, holiday programs, Christmas events, decorating, and everything else has a history of throwing pretty much everything totally out of whack. There are two areas where the holidays really turn my life upside down: the state of my house and our weeknight family dinners. I'll save my struggles with cleaning and organizing for another time – today is all about food. But you've probably heard about the magic that happens to cauliflower when it's prepared in different ways. It has the ability to imitate mashed potatoes. It can be made into pizza crust and breadsticks. It's been used as a chicken substitute when covered in buffalo sauce or Asian glazes. In short, cauliflower is a miracle vegetable! 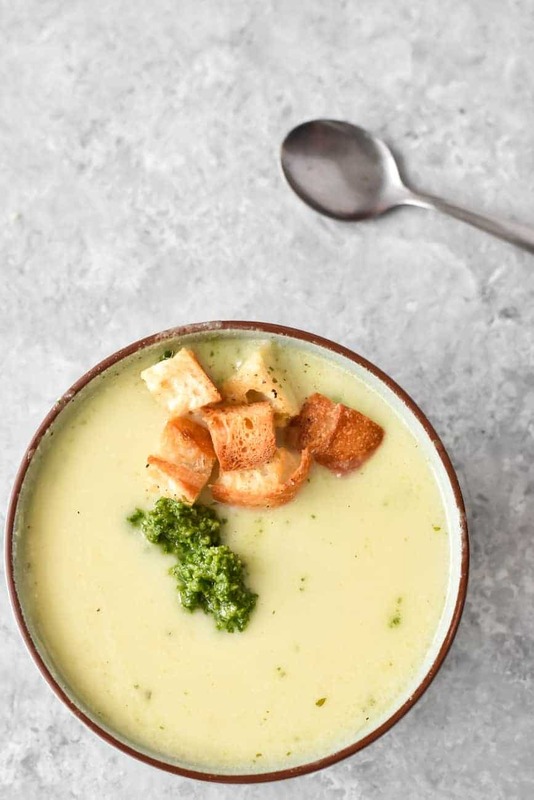 So, this Cauliflower Cheese Soup recipe is one of those miraculous things that can be done to cauliflower to take it far, far away from its most boring, sometimes bitter origins, and turn it into a smooth, savory dinner that the whole family will love. The soup on its own is perfectly tasty. It has a rich, velvety texture and a rich cheesy flavor. But I added some homemade croutons and my very favorite cilantro pesto. The combination brought the soup to a level of deliciousness that had me dipping my extra croutons into the soup pot after I was done eating! I think the secret that makes the cauliflower delicious but undetectable in this soup is the Caldo Knorr® Selects con sabor de Pollo from Superior Grocers. You can save on Knorr Selects products from 12/5/18 – 12/11/18 at your local Superior Grocers! 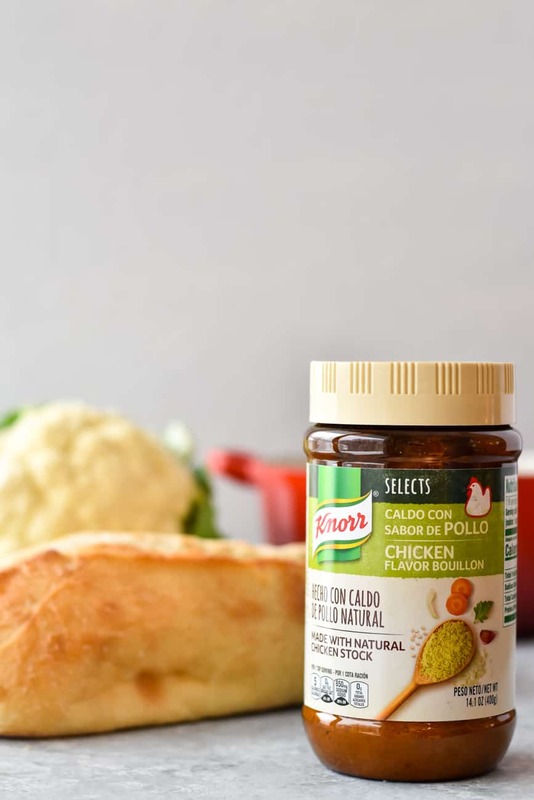 Caldo Knorr Selects con sabor de Pollo is a chicken bouillon that is actually made with natural stock and has no artificial flavors, colors, or preservatives. 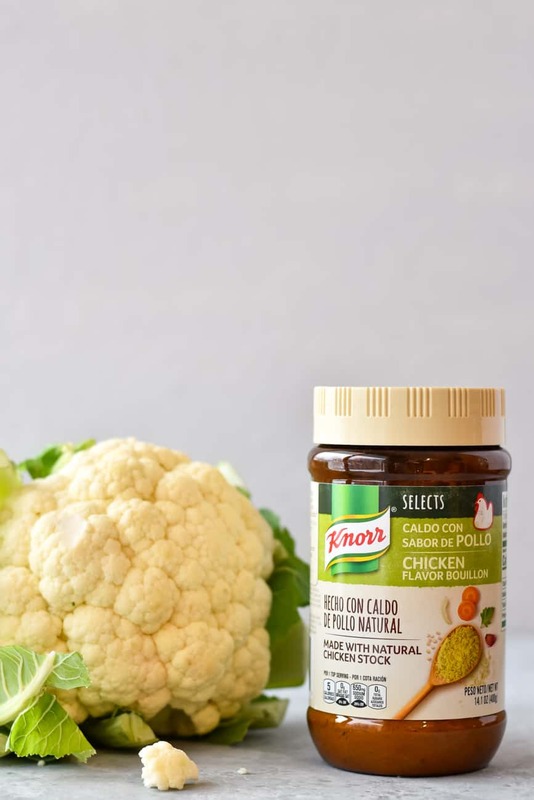 Compared to traditional bouillon, Knorr Selects Bouillon has no added MSG, and has 20% less sodium, 30% less ingredients, a cleaner label and it simply has more premium ingredients compared to traditional bouillon. No wonder it makes this soup so good! 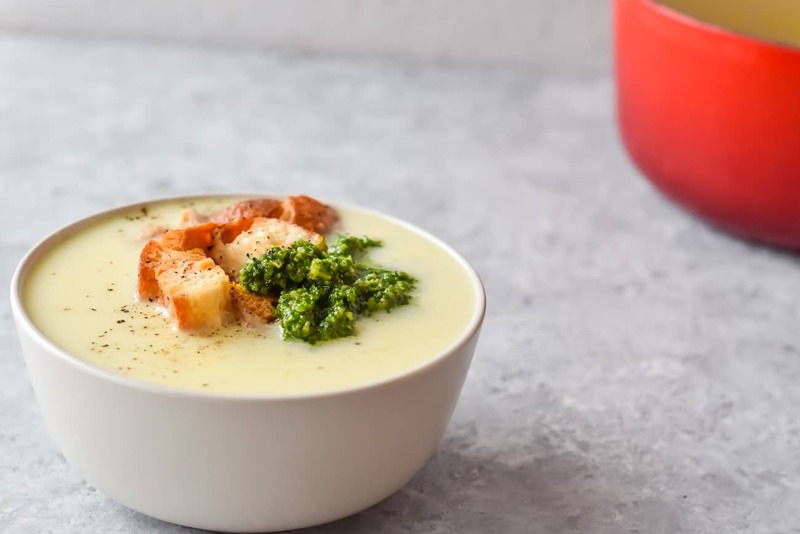 My husband was so surprised when this Cauliflower Cheese Soup was done and on the table less than 30 minutes after I started cooking. We're used to soups taking a few hours, especially since there's almost always simmering involved. Of course, you'll need a few extra minutes to chop the veggies and shred the cheese. 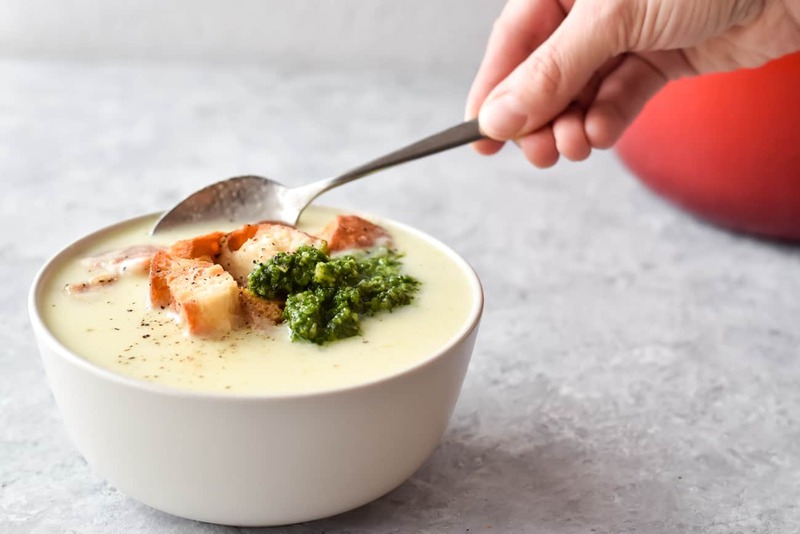 Even if you choose to make the cilantro pesto (that recipe can be found below the soup recipe) you're still going to have everything done in under 30 minutes, I promise! Heat the butter in a big sauce pan or soup pot over medium heat. Add the onions and cook for until translucent, then turn the heat down to medium-low and let them cook for another 5 minutes, stirring occasionally. Chop the cauliflower into florets and throw away the biggest parts of the stems. Add the cauliflower, water and bouillon and turn the heat up to medium-high. Cook until the cauliflower can easily be pierced with a a fork, about 10 minutes. Transfer the soup to a blender or food processor or use an immersion blender to puree until smooth. Add the cheese and give it another spin in the blender to help incorporate it. Return the soup to the pot and heat it if the cheese still needs to melt. top with optional cilantro pesto and/or croutons to serve. 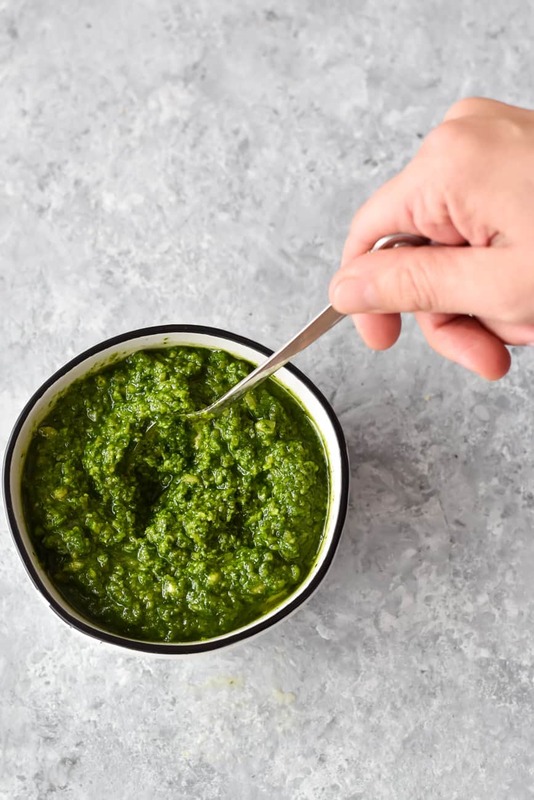 If you love cilantro, I have a feeling you're going to want to marry me after you make this cilantro pesto. It's that good. It's also crazy easy and takes just a few minutes to make. Hold the bunch of cilantro by the leaves and chop off the exposed stems in one swoop. You can leave the rest of the stems attached to the leaves. Toss this in your food processor. Add the garlic, olive oil, salt and lime juice and pulse until mostly smooth. Add the almonds and pulse a few more times. 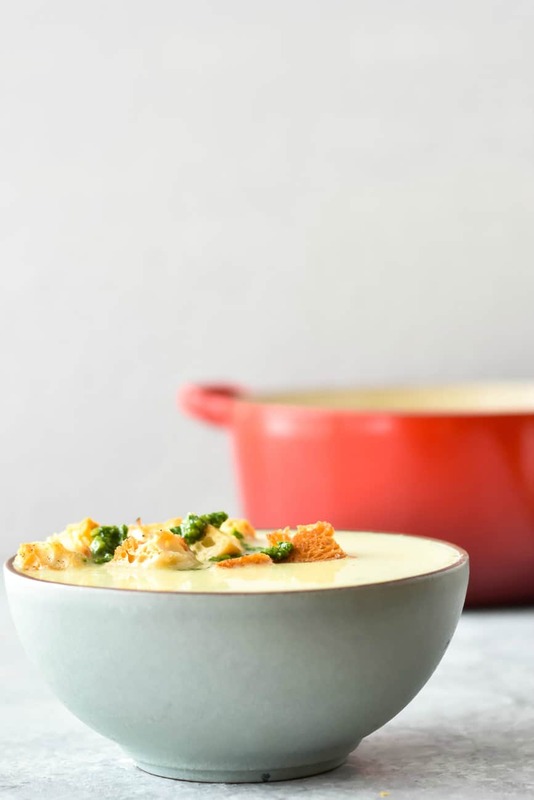 Now you have everything you need to make the most delicious Cauliflower Cheese Soup dinner for your family…in 30 minutes! With the craziness of the holidays sneaking up, you’ll be extra happy you found this recipe! From 12/5/18 to 12/11/18, you can save on Knorr Selects at your local Superior Grocers. Want more easy and delicious inspiration? Check out the Knorr recipe page! 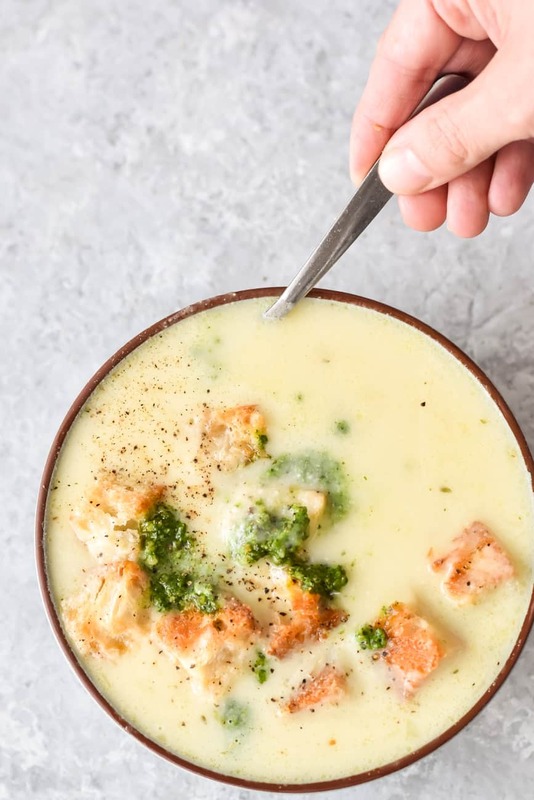 This 30-minute cauliflower cheese soup recipe is so rich and creamy, and all you need to make it is an onion, cauliflower, olive oil, broth, and cheese!